Are your locals coming from two different directions? Are you stuck in the middle? It’s a common problem. To solve it, put up two antennas and combine the signals! 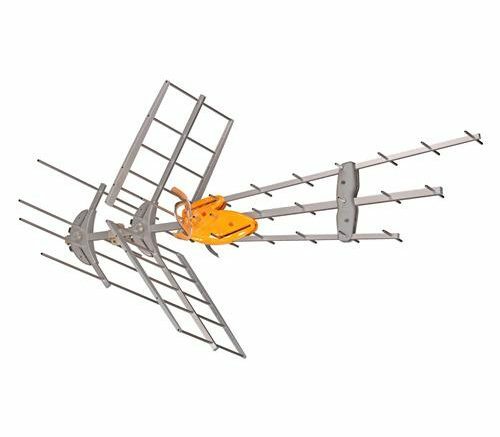 We also recommend an antenna amplifier like this one: Channel Master Titan 2 High-Gain UHF VHF TV Antenna Preamplifier (CM-7777) from Solid Signal to make sure the signal is as strong as it can be. Connect the two antennas to the combiner using equal length cables. This will help avoid phase problems. Note, it is possible that both antennas could pick up the same signal and create interference that could actually make interference worse. Aim carefully to try to avoid that. Then, run a cable to the splitter that comes with the amplifier. The power injector should go in the right side of the splitter, so power can flow though properly. Run a cable from the left side to your television.